Be Used On Your Project?" 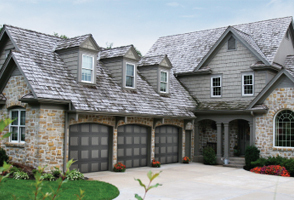 Panel garage doors can bring a facade to life with the shadow and light play of their varying surface elevations. They add a special dimension to the front elevation of any home. They are appropriate for the traditional style of home design and in some contemporary settings. They come in nearly unlimited configurations and can have windows in the top panels when appropriate for the overall design theme. They are available in wood or steel that is insulated and can have a smooth surface quality or a wood grain texture. They have a distinct appearance separate from flush garage doors and can add a great deal of value to your home. The photo at the left shows panel doors manufactured by Overhead Door from their Smooth Select 101 Series. This series is non-insulated, but you can get the same doors in the Elite Series with insulation bearing an R-value of 7.3. These garage doors are very green-conscious as they are manufactured from 88% recycled Douglas-fir. These garage doors feel, look and sound like solid wood. The recycled Douglas-fir is fused with exterior grade waxes, resins and sealers and mixed into dry compounds that allow the finished product to resist moisture, splitting, cracking, checking, warping, denting, panel shrinkage/bending, and all of the other problems that panel garage doors manufactured from solid woods can suffer. They are SCS Certified to contain a minimum of 88% recycled content according to their manufacturer.There is no need to apply exterior primer paint to the surface prior to applying your color coats as the surface is prepped and ready to accept finish paint right from the factory. 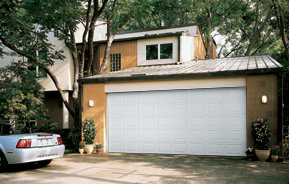 These garage doors feature an aluminum bottom seal retainer containing a replaceable long life weather seal. This product comes with a 5-year limited warranty. The photo at the right illustrates panel garage doors in a contemporary setting also manufactured by Overhead Door. These garage doors are premium insulated steel that will aid in keeping your garage comfortable in cold and hot climate zones. They are packed with polyurethane insulation with an R-value of 17.5. They feature hot-dipped galvanized surfaces with two coats of baked on polyester paint. The joints between the panels are constructed with in-between section seals that minimize air, light and moisture infiltration during heavy-wind and rain storms. The cross-section at the left illustrates a cut-away of the door construction and the bottom seal. This product comes with a limited lifetime warranty. Both of the overhead garage door series featured above come in a variety of widths and heights for residential purposes. You should consult your local Overhead Door® dealer near you for exact sizes, styles and pricing. If you have low-ceilings in your garage, they have special track systems that will accommodate your situation.